Microbial cells can improve the functionality of clothes in creative and useful ways, including cooling us down during a workout or making clothing glow for better visibility. The innovative products were developed by a team of 14 researchers from MIT, in such broadly diverse fields such as mechanical engineering, chemical engineering, architecture, biological engineering, and fashion design, as well as researchers from New Balance Athletics. The project, named bioLogic, was co-led by Wen Wang, a former research scientist at MIT's Media Lab and Department of Chemical Engineering, and former graduate student Lining Yao, part of MIT's Tangible Media group. "We can combine our cells with genetic tools to introduce other functionalities into these living cells. We use fluorescence as an example, and this can let people know you are running in the dark. In the future, we can combine odor-releasing functionalities through genetic engineering. So maybe after going to the gym, the shirt can release a nice-smelling odor, " said Wang in a press release. Development of the new products is detailed in a scientific paper published May 19 in Science Advances. The hygroscopic nature of bacterial cells — their ability to absorb water from air — and the resulting change in the size of the bacterial cells was the basis for the development of the new workout clothing. 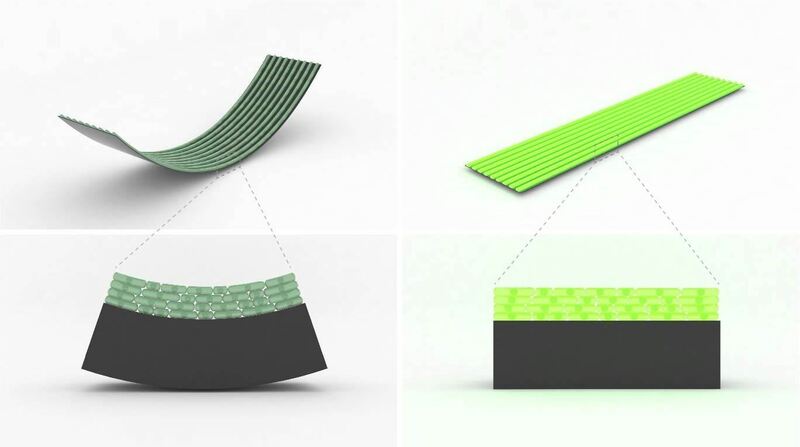 In addition, bacteria can induce bending of the surface they are coated on, providing the flexibility needed during exercising and a way to activate flaps in the clothing. The researchers deposited microbes on humidity-inert sheets of rough, natural latex — a material that does not change its properties as the humidity changes — to form a multilayered structure called a biohybrid film. The design team relied on the moisture-responsiveness of the bacteria to fashion a breathable workout suit with ventilating flaps powered by microbes. Tiny support frames underneath each flap keep the fabric's inner cell layer from directly touching the wearer's skin. The researchers lined the ventilating flaps with live microbial cells that are tiny sensors and actuators driven by their hygroscopic nature, which causes the flaps to open when they sense the athlete sweating and close when their body has cooled off. The flaps are flat when not responding to changes in humidity, and the swelling bacteria cause the biohybrid film to curve as the cells expand when responding to changes in humidity — creating an automatic air vent. A running shoe prototype has also been developed, equipped with an inner layer of microbe-lined flaps to air out and wick away moisture. 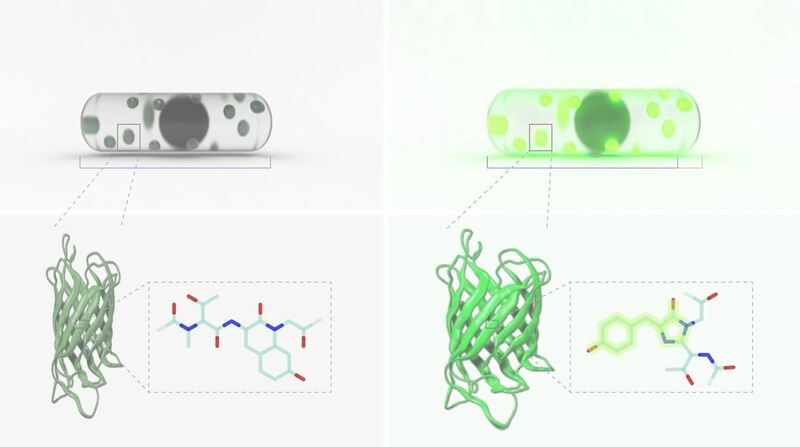 Capitalizing on our ability to engineer genetic mutations in bacteria, the researchers generated cells that expressed green fluorescent protein, enabling the cells to glow when they sense humid conditions and creating better visibility of the wearer in low light. 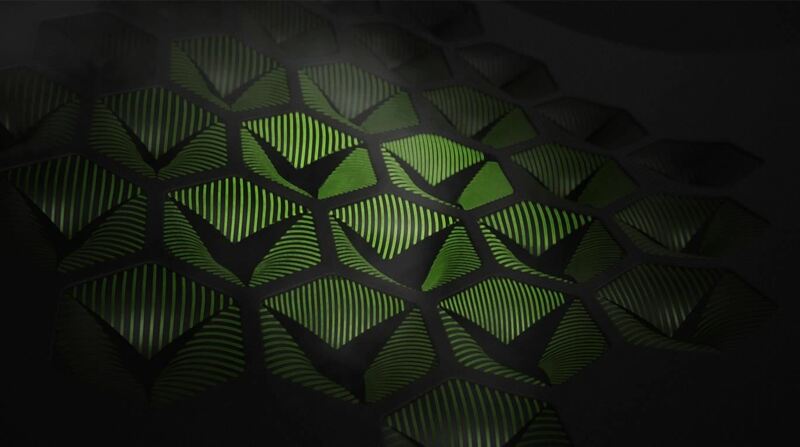 The new biohybrid films can reversibly change shape and fluorescence intensity within a few seconds in response to changing environmental humidity. Safety and sweat were two elements considered in the design, production, and functionality of the new products, as well as the performance of the products developed by the team. The researchers knew they had to use non-pathogenic bacteria and wearing it should not pose a safety concern. They chose Bacillus subtilis for their wearable garments, a bacteria given "generally regarded as safe" status by the US Food and Drug Administration (FDA). Because this bacteria is common in soil, people frequently come into contact with it. It is also in some food products, including Japanese natto soybean food, a food shown to provide beneficial health effects. To develop prototypes of running shoes, they worked with a non-disease causing E. coli — not listed as "generally regarded as safe" — because it's easy to genetically modify. Once the researchers finish designing the shoes, they plan to find an organism with FDA safe status that they will genetically modify or a naturally fluorescent microbe used commercially. In the future, they intend to investigate whether they can replace the bacteria with parts of them, like proteins and nucleic acids, which could retain the moisture-responsive properties needed in the garments. The design of the garments considered the amount of sweat the wearer might generate and movement during exercise. The team extensively tested performance on each of these. Not all parts of the body sweat at the same time or in the same amounts. Location and size of flaps bearing moisture-responsive bacteria were designed and redesigned to pinpoint areas of greater or lesser need. Ventilating flaps needed to open in areas when high skin humidity was detected and close when humidity was lower, and they couldn't impede movement. Shoes were designed to promote moisture removal from the bottom of the feet — where warts and fungal infections are prone to develop — so humidity-removing flaps were positioned nearer the bottom of the shoes, instead of at the top. Garment performance was evaluated using heat and sweat maps generated using small sensors placed on the backs of study participants who wore the clothes while working out on exercise treadmills and bicycles. Not only did they work, but when Wang herself tried the garment she compared it to having an air conditioner on her back. Future work will further investigate the stability of the items, but testing of fabric-containing microbes has already shown that bending performance was not affected by 100 dry-wet cycles. The study authors believe that washability and durability of the wearables can be improved by design changes and through the use of chemistry, such as immobilizing microbes onto surfaces through covalent bonds. "We foresee that this scalable and adaptable technology can be used in industries beyond fabricating wearable devices, where moisture gradient is a key factor, such as hydration enhancement in skin care products, humidity control in a smart home, and moisture removal in biomedical textiles," wrote the study authors. Putting together a multi-disciplinary team to approach and solve a problem has resulted in not just innovative new products, but in new technology whose application is seemingly boundless.